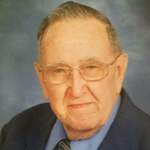 Sterling Harvey Walker, age 87 of 565 Roxbury Street, Clifton Forge, Virginia went to be with his Heavenly Father on Sunday, July 8, 2018 at the University of Virginia Medical Center in Charlottesville. He was born January 4, 1931 in Long Branch, New Jersey to the late Sterling Thomas and Annie Velma McGuire Walker. He served in the United States Air Force, and was a retired conductor for the Chesapeake and Ohio Railroad and Amtrak. He was a longstanding member of the Clifton Forge Baptist Church, as well as devoted deacon and very active chairman for the church’s Building and Grounds Committee. He enjoyed cooking and listening to country music, and loved railroads and trains. In addition to his parents, Sterling was preceded in death by his wife, Dorothy Mae Vest Walker a daughter, Anita Walker Fagg; and two sons-in-law, Darrell Coffey and Bill Sims, Jr. He is survived by three daughters, Brenda Walker Sims Watson and husband Walter of Clifton Forge, Teresa Coffey of Clifton Forge, and Melinda Walker Barr and husband Steven of Eagle Rock; a son, Quintin Walker, Sr. of Clifton Forge; two sisters, Donna Walker Conner of Gainsville and Velma Simmons Sturgill of Aldie; a brother, Vernon Walker and wife Barbara of Kernersville, NC; thirteen grandchildren, Joshua Barr and wife Brandi, Alex Barr, Joey Barr, Adam Barr, Quintin Walker, Jr. and wife Michelle, Stormy Walker Mace, Lauren Mattox, William Sims, Thomas Sims, Dorothy “Dottie” Wolfe, Gary Coffey, Judy Hott, and Frankie Lee Fagg; fifteen great grandchildren, Hailey Sims, Emma Sims, Bryce Sims, Elizabeth Sims, Sierra Hott, Tyreece Davis, Joseph Davis, Hayden Coffey, Stephanie Walker, Destiny Walker, Elektra Walker, Michael Walker, Skylia Mace, Autumn Mace, and Aurora Barr; and a number of nieces and nephews. A funeral service will be held on Saturday, July 14, 2018 at 2:00 PM in the Clifton Forge Baptist Church in Clifton Forge with Reverend Tom Harvey officiating. Interment will follow in Alleghany Memorial Park, Low Moor. The grandchildren will serve as pallbearers. The family will receive friends on Friday evening from 6:00 PM until 8:00 PM at Nicely Funeral Home, Clifton Forge. Nicely Funeral Home, Clifton Forge is handling arrangements. The family suggests memorial tributes take the form of contributions to the Clifton Forge Baptist Church, 511 McCormick Blvd, Clifton Forge, VA 24422. To send flowers to the family of Sterling Walker, please visit our Heartfelt Sympathies Store.